With over half a century’s styling experience behind it, BaByliss is a leading name in electrical beauty products. The BaByliss hair dryer range features the latest in hair care innovation for fast, smooth salon-quality blow drying at home. Performance, precision and protection lie at the heart of the BaByliss hair dryer collection. Choose from a range of high-performance dryers that are designed to deliver powerful drying while protecting hair while also looking the part themselves. With neat salon touches like hanging loops for tidy storage and up to 3m cord length for ultimate ease of movement, they deliver a professional feel. 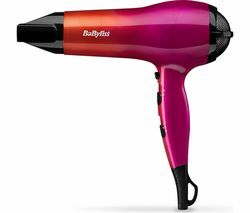 The BaByliss Futura Dryer features a built-in advanced airflow system that provides twice the drying performance of a regular hair dryer giving fast drying results, even on thicker hair. It is cleverly designed to deliver a powerful airflow, giving you the drying performance equivalent of a 2200W dryer; yet is only 1700W. The lower wattage output means not only lower energy consumption but also ensures that there is less heat stress on your hair. The result is enhanced hair condition for overall shiny, frizz-free manageable hair. Choose from 3 heat settings, including turbo for express drying and cool shot to help set your hair in a long-lasting style. 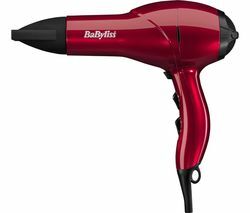 The BaByliss hair dryer range utilises ionic and ceramic technology to care for hair. Its ceramic outlet air grilles and ionic conditioning system ensures a frizz-free, shiny finish after every blow dry. The concentrator nozzle gives you precision control over directed airflow for more concentrated styling, while removable rear filters make BaByliss dryers really easy to clean. The BaByliss Performance 3Q 5665U Hair Dryer has an advanced brushless motor to deliver a fast, controlled airflow for precision styling, and also features noise reduction, for a quieter blow dry that won’t disturb others around you while you style your hair. For more innovative hair care options, take a look at the latest Dyson hair dryers and see our Remington hair dryers for advanced styling power.